We believe in challenging ourselves, thereby strengthening our community and doing good to those in need. In wintertime we meet up every Saturday from 10-11am to go ice bathing together and collect donations for the homeless who suffer the most from the cold. Our movement started in Berlin, Germany. We first got together in the early winter of 2017 when the water was still 10°C warm. We continued to go ice bathing every Saturday, even when the outside temperature was way below -15°C and the water was covered in a thick shield of ice. We stopped when the water hit the 10°C mark again in late March, after 23 weekends of consecutive ice bathing. Now, in Spring 2019, we’re looking back onto our second season and we’re absolutely astonished by the growth of our community. We are starting to realise that what we created is something far bigger than just a regular event. We literally turned around people’s perception on winter to a point where they are mourning the „end of season“ in March – a time when everybody else can’t wait for summer to finally arrive. We created a space of encounter where there had been nothing like it before. We meet up from 10-11 am at the Eastside of the Plötzensee lake every Saturday from the last weekend of October through the last weekend of March. We lead a deep breathing session according to Wim Hof. We are not certified Wim Hof instructors and we do not claim to be associated with his person or any of his instructing businesses. We line up and scream together, as loud as we can, before going into the water. That frees you up. We dip. 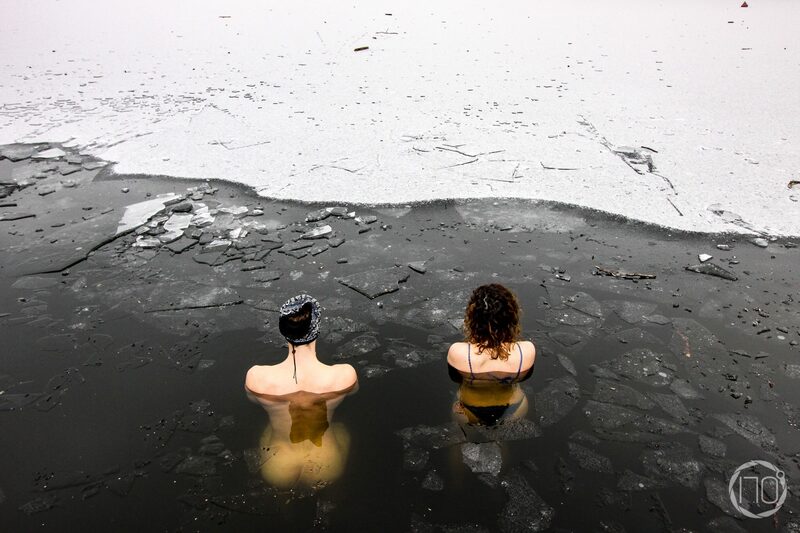 We endure the cold water as long as we can. There is no time measurement or anything of that sort though. This is not a competition. It’s about letting go & surrendering to nature. We have one rule: Stay quiet as long as people are in the water. They are trying to push their mental & physical limits and want that peacefulness so they can focus better. We serve free tea after the dip & chat together. Everyone is so lit up and enthusiastic that this is an unparalleled group experience.